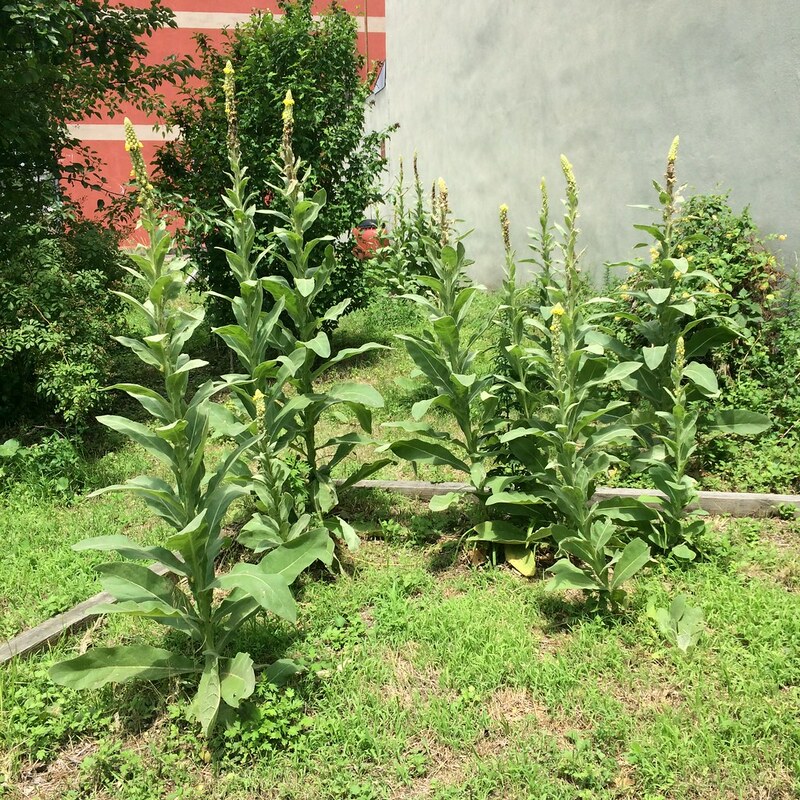 When my colleague at the Red Hook Community Farm informed me that she had added a mullein plant to our bee garden, I was delighted. Generally considered a weed, Verbascum thapsus is a striking and readily manageable plant with loads of educational and practical uses. 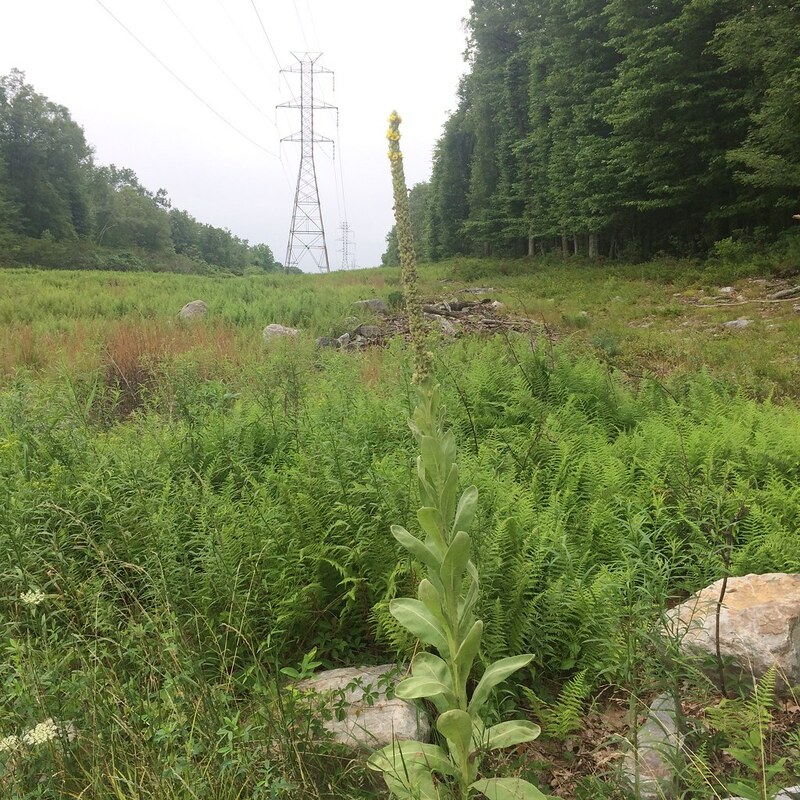 Though a native of Eurasia, mullein doesn’t deserve the vilification often reflexively bestowed on nonnative plants that have naturalized here. Its preference for disturbed soil, its drought tolerance, and its juicy flowers and feltlike leaves all offer important ecological services for the local environment. First off, just look at it! 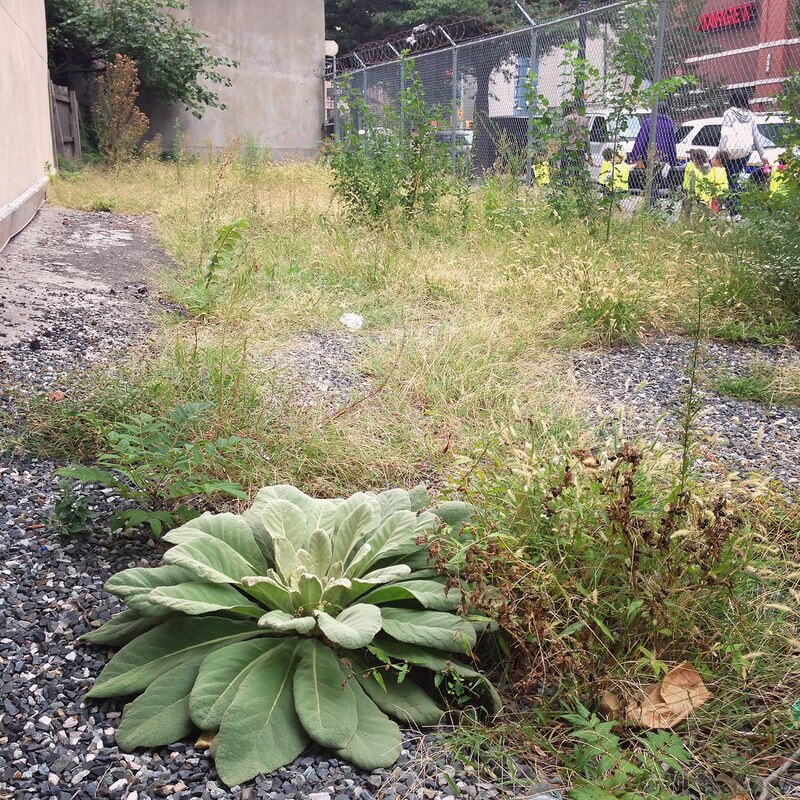 Mullein’s first year of growth as a biennial is a rosette of pale green, fuzzy leaves that may span only a few inches across or be several feet wide. The second year, a flower spike emerges—some grow up to six feet high—with bright yellow flowers favored by bees and other pollinators. 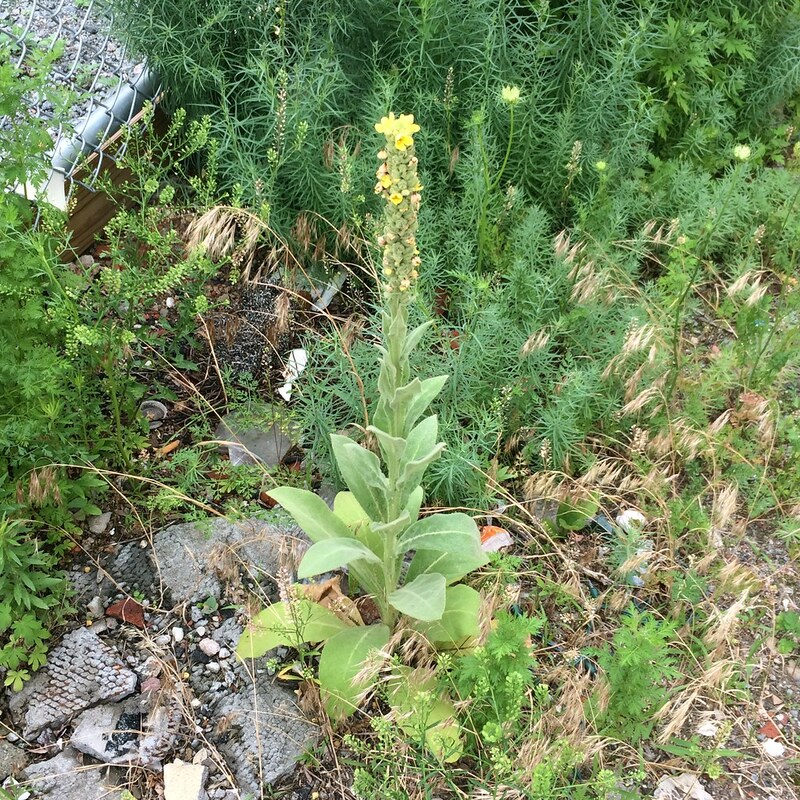 In tiny sidewalk cracks, open lots, and dry, rocky roadsides, mullein cheerfully appears without overwhelming the landscape, unlike some of its weedy brethren. In fact, a lone plant or small colony may appear in a disturbed area, live out its two-year lifecycle, and then never appear again as other plants emerge. The bloom patterns on the mullein's flower stalk are fascinating to observe throughout the summer. Each individual flower lasts no more than a day. A few open at a time, starting from the bottom of the stalk and moving toward the top, in successive, overlapping spirals. Because the flowers aren’t all open at the same time, the flower stalk does tend to look a bit scraggly—at once partially in bloom and partially in decline. But while you’re looking at the spike, do a pollinator survey to see how many different species of bee, wasp, fly, and bird are coming by for a snack! In addition to its value to pollinators, mullein has been used by humans for centuries for everything from lining shoes to warding off the evil eye. The stalks have been used for candles, torches, and lamp wicks. Others have observed the flowers to predict the weather. Fisherman were known to throw the seeds, which contain rotenone, in the water to stun fish for easy catching. The flowers can be used as a yellow dye, and the crushed leaves work as DIY rouge. The medicinal uses for mullein have included pulmonary, skin, respiratory, digestive, and circulatory remedies. 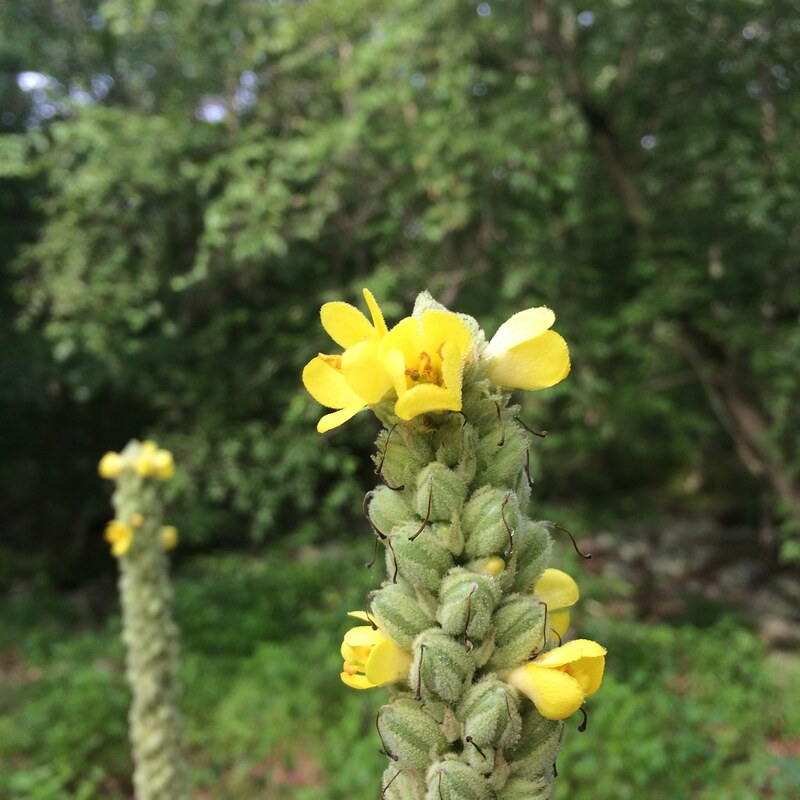 For respiratory ailments, mullein appears to a be particularly popular treatment. Though brought to North America by Europeans, Native Americans apparently adopted the plant as an additive to tobacco. Smoking this mixture was said to be an effective cough treatment. I am a novice in herbalism, but I hope to try a recipe for cough syrup using mullein, red clover, white pine, cherry bark, and honey that I read about in Pamela Jones’s Just Weeds. The key ingredients are in their summer prime, so now’s the time to collect! Saara Nafici is the executive director of Added Value/Red Hook Community Farm. She is also the former coordinator of the Garden Apprentice Program at Brooklyn Botanic Garden and a longtime activist, feminist, bicyclist, naturalist, and youth educator. Follow her weedy plant adventures on Instagram. I’ve read that during the Civil War the leaves were used to cover wounds when nothing else was available. Mullien was a common pasture plant in our farm in southern New Hampshire. Its dried stalk made a great impromptu “sword” for play, and I remember my father using a smoldering stalk to set fire to gypsy moth nests. In its first year of growth, mullein produces a rosette of pale, fuzzy leaves, but no flowers. Photo by Saara Nafici. In urban areas, it often emerges in rocky, dry areas. It grows much taller and produces its distinctive flower stalk in its second year, so you'll see it flowering in abandoned lots where it's been left alone for some time. Photo by Saara Nafici. Mullein likes recently disturbed soil, but unlike many weeds, it doesn't necessarily proliferate widely. It's a classic pioneer plant, establishing itself in places where few other plants are present and then making way for other species when its life cycle is complete. Photo by Saara Nafici. Only a few of its bright yellow flowers are in bloom at a time. Photo by Saara Nafici. 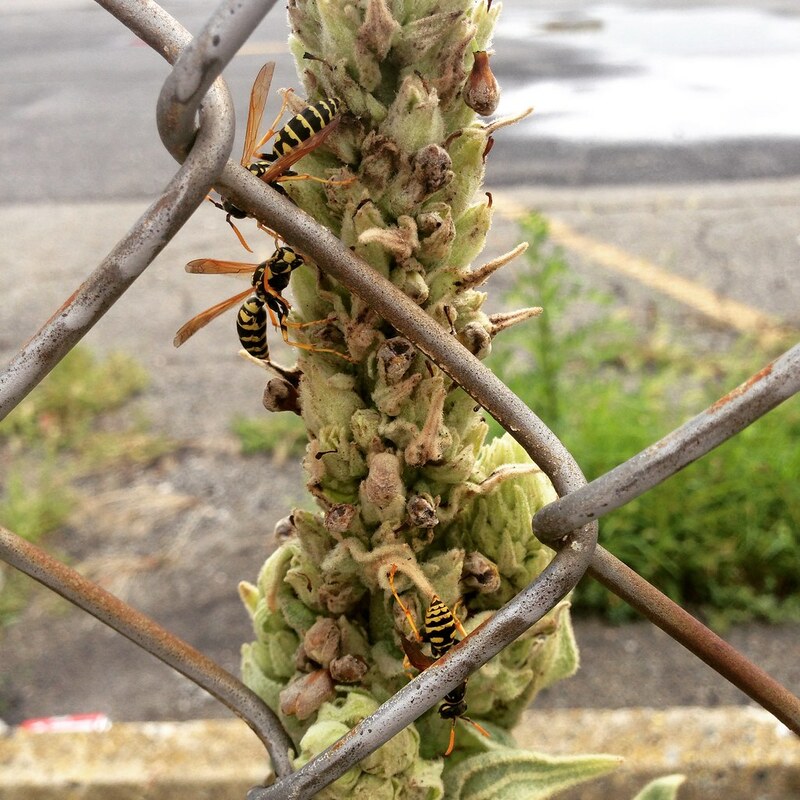 Wasps, bees, and other pollinators are crazy about mullein's flowers, which bloom in succession starting at the bottom of the stalk and spiraling up. Photo by Saara Nafici. Mullein can be cultivated as a garden plant. Photo by Saara Nafici.